Lucinda "sandy feet" Wierenga has been building awe-inspiring sandsculpture all over the world since 1987. She has taught tens of thousands of people how to build a better sand castle through private lessons and via her best-selling book - Sand Castles Made Simple. 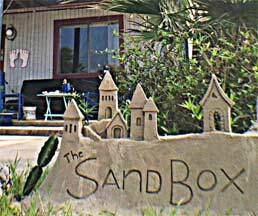 She creates custom beach billboards, timelapse videos and semi-permanent garden sculptures at her sandcastle-themed guest house - The SandBox Inn - located on beautiful South Padre Island, TX. New! Are you IN LOVE? Thinking about POPPING THE QUESTION? Have you heard about the hottest way to propose to your sweetie? 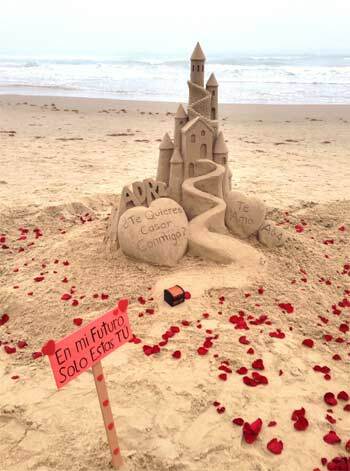 We're talking wedding proposal sandcastles and they are more affordable then you might think! 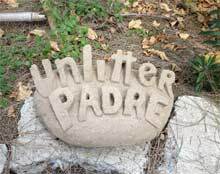 Working closely with the town staff of South Padre Island, we created some real sand sculpture magic last summer -- and hope to do it again -- even better! -- in 2014. 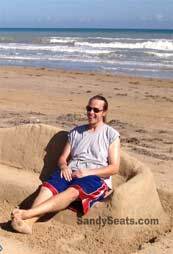 Front Row Beach Seats - Created on South Padre Island, Just for YOU! Customizable in an endless number of ways with your name, logo, school, URL, etc. Built-in cupholders, stratigically placed! We'll do it for you - or bring the tools and show you how. Rates start as low as $100 (build it yourself, we provide equipment and coach) or $200 (we bring a team and build it for you). We offer gift certificates- treat someone you love to a comfy lounger or couch the next time they visit South Padre Island! HeartStones Just in time for Valentines Day -- the perfect gift for the SPIslander who has everything -- except a sandy feet original! May be easily customized. Prices start as low as $30. Place your order today! Take a little bit of Padre home with you. These Little Sandy Things go anywhere -- even out in the elements. They can grace a garden, get planted in a pot, fancy up a footpath or decorate a deck. They can be customized to suit you -- each is a hand-carved original by sandy feet! Light enough to move, weighty enough to stay put, and built to last! the carved sand is treated with a soil solidifier that makes the sculpture impervious to extreme weather. These Little Sandy Things are happy inside or out. 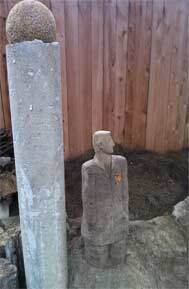 I can also construct something much larger in your yard -- built to order! 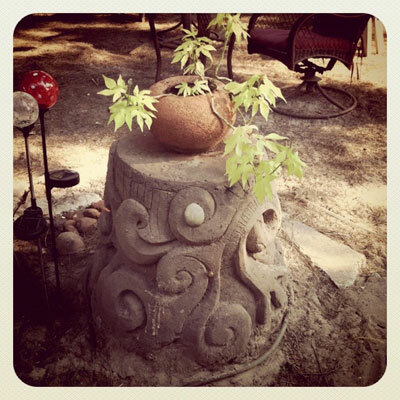 Pedestals, garden dividers, planters, solar light fixtures -- I love a good challenge! 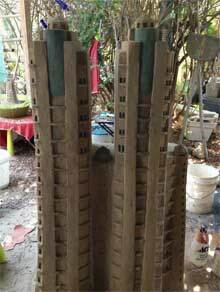 and take a look at the constantly-evolving sand sculpture garden in the front yard of the SandBox Inn - 117 E. Saturn Lane, South Padre Island. This dog-friendly vacation rental is like nothing else on South Padre Island. Stay with sandy feet and get a free sandcastle lesson!